At the heart of the First Nations and Indigenous Studies major is FNIS 400, the research practicum. Each year FNIS invites more than 100 Aboriginal organizations to identify research needs that a student might address. Students meet with organizations and work to negotiate, design, and implement a project that will address the organization’s needs. 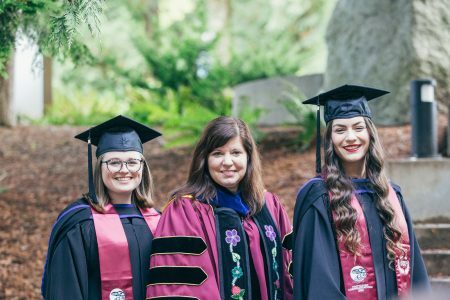 Students routinely identify the Research Practicum as the most meaningful experience of their undergraduate careers, a place where theory and practice coincide, bringing the university and community together to accomplish work of lasting value. November 2017 FNIS graduates Heather James and Danielle Kraichy with Dr. Sheryl Lightfoot. Photo by Dylan Hamm. Many organizations and communities have archives of materials that have accumulated over the years, but are unsorted and in storage. Sometimes the materials are old and beginning to deteriorate. A project might be for the student to assess what is in the archive, sort the materials, and catalogue what is there. The student could work with the organization to stabilize the condition of any materials that are deteriorating and determine how to organize them. From there, a research project could develop that takes the student and organization in any number of directions. Past students have worked at the Union of BC Indian Chiefs Resource Centre. Some students prepared historical documents for online access and written interpretive materials. Another student catalogued audiotapes of an important historical event. She then conducted additional research on the representation of the event in the press and presented her analysis as part of her year-end presentation. Many projects contain an interviewing component. Often documentary or archival work leads to new research directions, which requires designing and conducting interviews. Other projects concentrate on interviewing as the primary methodology from the start. Several students have worked on oral history projects using audiovisual technologies to document the stories and experiences of people involved in underrepresented histories. Such projects can provide significant material to organizational libraries and archives. For instance, one student’s oral history of the 1984 Constitution Express contributed to the collections of the Union of BC Indian Chiefs Resource Centre. Another student videotaped more than fifteen interviews with early leaders of the Native Courtworker and Counselling Association of BC, forming a valuable historical archive for the Association. One student interviewed a retired anthropologist for the UBC Museum of Anthropology and the Musqueam Indian Band. This provided an important record of this person’s work and career in Coast Salish anthropology. Each year there are also opportunities for students to work with political organizations. For instance, one student worked with the BC Assembly of First Nations to conduct interviews with community leaders on their attitudes towards self-governance in different communities. Another student interviewed Stó:lō community members about their knowledge of salmon in the Fraser River. This research aimed to help the Stó:lō Tribal Council develop policies on fish farming. It can be challenging for organizations to find the time, space, and resources necessary for research. We understand that many organizations are extremely busy managing day-to-day operations, applying for government or agency funding, and writing reports demonstrating need or effectiveness to sustain their work. Often the work of report writing ends up being done “off the corner” of a staff person’s already full desk. A practicum student can fill this gap, compiling the information, doing the research, and organizing it into an effective and readable report. The organization can benefit from the report, and the student can gain valuable research experience. Report-writing projects can include preparing needs assessments for existing organizations or proposals for the development of new or extended organizations. Previous practicum students have delivered literature reviews, analytical reports, and position papers for organizations. One student’s report for the Britannia Community Centre investigated the community’s need for an Elders in residence program. The report recommended how the program would best serve community members. Upon completion of the report the community centre carried forward those recommendations and extended the research project. Another student compiled a report on Fetal Alcohol Spectrum Disorder and the incarceration of Aboriginal peoples for the Vancouver Métis Community Association. The student performed documentary research and interviews with frontline workers to assist the organization in developing programs for FASD clients. Many projects are designed to involve a combination of the skills listed above. We are open to discussing ideas with your organization. We encourage organizations to think about what their research needs are and how students might design projects to address those specific needs. There are also opportunities for practicum students to fit into existing research projects under the supervision of experienced researchers, fulfilling a variety of functions as directed. For instance, a previous practicum student worked as part of a larger project for the National Film Board training young Aboriginal filmmakers. The organization can benefit from the timely completion of research, and the student can benefit from a valuable apprenticeship. We ask that student involvement in such projects be at a level that allows the student the opportunity to understand and participate in the design and strategic implementation of the project. These projects require additional preparation and monitoring. Please call us if you have an idea for one.